You know the 80:20 rule? The one that says that 80% of any given work take about 20% of your time, and the remaining 20% of the work take up 80% of your time? I personally find that this rule applies to almost anything you need to accomplish in life, and apparently it is also true for the violin making process as a whole and each step within it specifically. Last time I wrote about the Bombatura process – the arching process that defines the instruments’ external shape, volume and body – the heavy-duty work was basically done with, and the “only thing” that remained was to fine-tune the external shapes. Well, in addition to numerous other projects Yonatan has undertaken over the past three weeks or so, he has been working on this last 20% of the Bombatura process. As I wrote, special planes called “thumb planes” were used to carve the external arch of each instrument’s front and back. Below you can see two such planes during work on the viola. The trucioli – wood curls – they produce are very fine indeed. 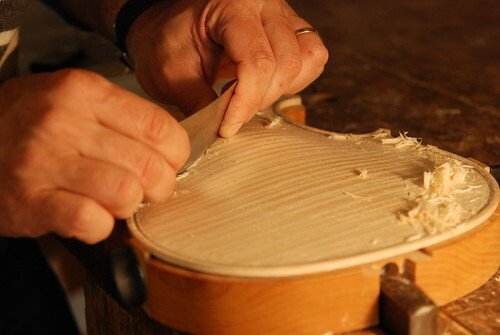 Then, when all four instruments have reach the phase that their external arching has basically been shaped and carved, Yonatan uses a special scraper (rasiera in Italian) to fine-tune the shape even further, and actually to smoothen the surfaces as you would with a sandpaper. So why not sandpaper? you may ask. Well, there is apparently a WORLD of difference: while sandpaper sands wood by scratching its surface (thereby leaving…well… scratches on it), the scraper really cuts the wood’s surface, like the planes and gauges do, but in a very exact and minimal way, leaving the surface smooth and scratch-free. When Yonatan first set up his workshop in our apartment in Cremona, this was one of the phases that blew me away – seeing his never-ending patience as he scrapes one thin layer of wood, and then another … and another still…. until finally the surface of each instrument becomes smooth and begins to glow so that the distinctive shapes and colors of the wood begin to really show. Once this phase ended and all four instruments’ fronts and backs were smooth and shining, Yonatan put them away for a day or so. The next morning, he came into his workshop, lined all of them up (four instruments, times two pieces, so eight pieces all in all) and took “a fresh look” at them. He went once again over each of them, to check if the shape of the body is what he wanted to achieve, and made final corrections and modifications. Then, once again, he placed all of them next to one another and checked that the “line” he created has a common denominator for the entire Quartet. And finally, as he did at the end of the “purfling” process, he attached each instrument’s front and back to the appropriate wooden mold, to make sure the pieces don’t bend out of shape from humidity, temperature changes etc. 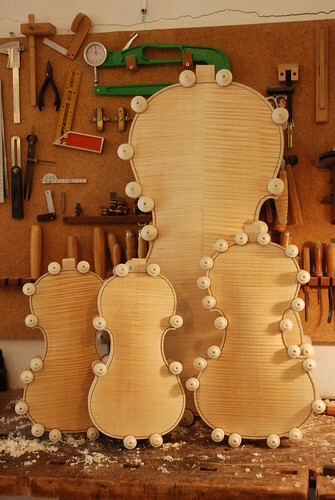 He uses special clamps for this purpose, that have rubber endings and do not harm the delicate wood, and when these claps are attached all around the instrument – smaller clamps around the smaller instruments, and larger ones around the mold of the cello – the instruments have a very particular look, as if there are snails or multiple eyes all around them… or maybe they actually look like the famous Barbapapa family!. ..it's been a while so check out lots of new picturs in the Quartet Slideshow!!. One difference between sandpaper and a scraper is that sandpaper removes preferentially the softer portions of the grain whereas the scraper takes down the surface evenly. giving us each of these steps. 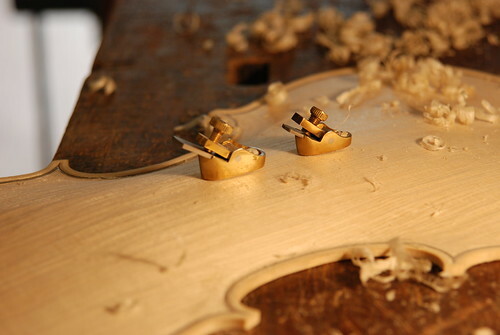 This is the closest I'll ever get to seeing a violin being made at each stage.